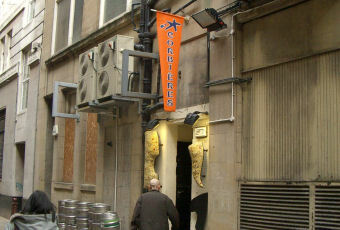 It's amazing that in all my years drinking in Manchester, I never knew this place actually existed! Talk about a hidden treasure? Not sure if the caved walls are authentic or not, but it has a definite vibe and chilled out feel. As most previous reviewers have rightly pointed out - jukebox is cracking. Only negative is the prices - £3.50 a throw. Ouch! You want character? You want Manchester? Then this is your place. Great Jukebox, great atmosphere. Can't fault it. I wish I lived in the center so I could frequent daily. Corbiere's just carries on being Corbiere's, a great place to hide away from the world. The only thing that's changed in years is the smoking ban - just as well, as the place has no windows! Just one cask ale, usually Bazens' Pacific - and it's no longer contaminated with that peculiar smokey taste, that's gone. Good, cheap food available up to 4 p.m. or so. I particularly like the quesadilla with refried beans (�3.75 inc salad). 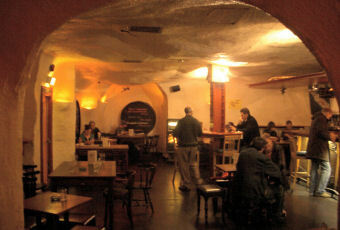 I like this pub, it's different, like the Star Wars Cantina. As I've mentioned previously. They should drop the Wine Bar title as it isn't And the outside decor looks like an 80s 'live at Jongleurs setting', it isn't. PLEASE NOTE - Please change the Pacific Bitter, it;'s absolutely vile and has been for at least 19 months, taste's and stinks of smoke really, really badly. I have complained, I'd dare any member of staff to sample it!! good place, good looking, good jukebox, so lets make the only ale on tap something decent please! My shout would be for Manchester brewed Marble beers which is THE best beer in town and criminally only served in 2-3 pubs!!!!!!!!!!!!!!!!!!! !